• Our Windsor (Berkshire England) FISH DNA analysis shows that our family belongs to the R1b1a2a1a1 DNA Haplogroup. • We tested positive for the following SNP’ s P311 + P310 + L49 + L23. The following populations in Devon, Buckinghamshire, Somerset, Wiltshire, London also tested positive for these SNP’s in England. • We anticipate that our deep ancestral roots may originate in Devon, Somerset, Wiltshire, Buckinghampshire, Hampshire or Ireland around 1400 to 1500 or earlier. I am hoping that FISH families in these areas may want to help me with our Family research by undertaking there own DNA analysis. • We use the best DNA testing company called FamilytreeDNA. See the World FISH DNA Study website at http://www.familytreedna.com/public/fish . 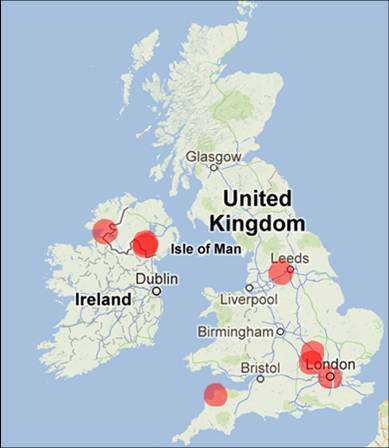 By contributing to the global FISH DNA STUDY, you will help us all understand the British FISH family origins. This will help us all connect branches of our family trees that is impossible to connect without the paperwork. 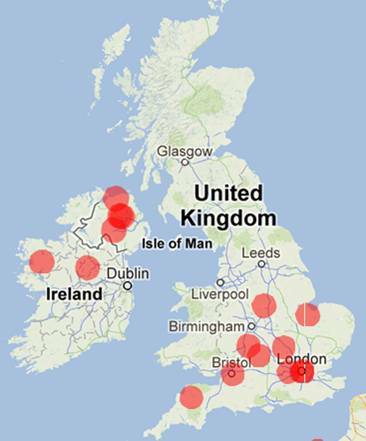 The red circular areas below represents the population origins for the SNP L23 and P310 markers in the UK. 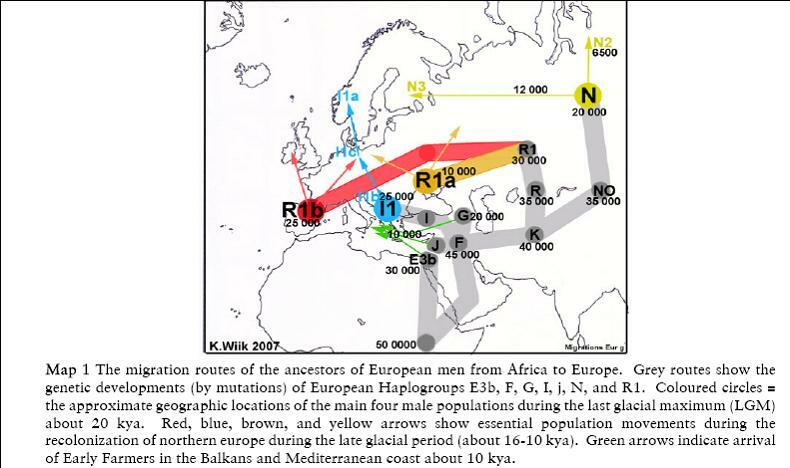 The map above shows the early migration paths of our DNA Haplogroup R1B1a2a1a1. 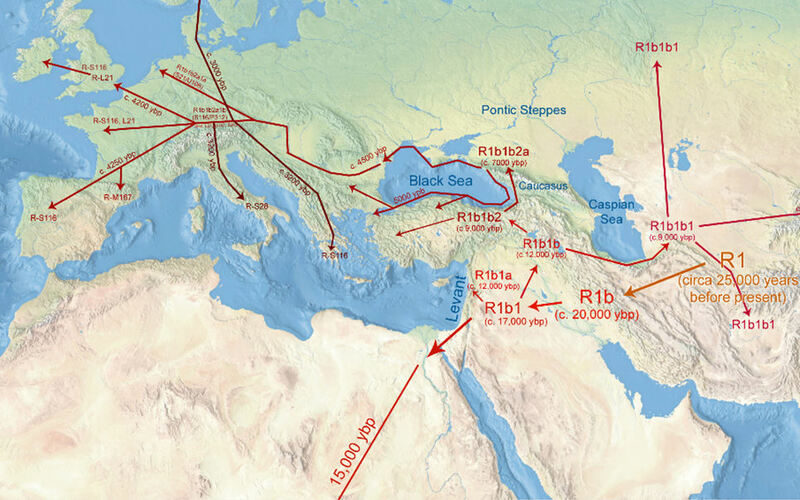 This is the migration path our family took going back over 20 000 years. 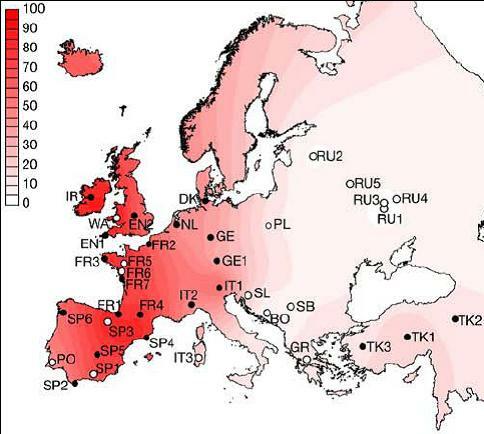 R1b1a2a1a1 (L11 or P310 ) is the parent of the “Atlantic Modal Haplotype or “Western European “R1b” Around 50 to 60% of north Italian, Iberia, German, English and French men belong to this group, while its frequency exceeds 80% in more isolated areas like Ireland, Scotland, Wales, Bretagne and the Basque county. Its frequency is decreasing towards Scandinavia, East Central Europe and Southern Italy (20 to 30%) , falling below 5% in Rusiia, the Balkans and the middle east. Its age is between 6500 - 5000 years BP or 4500 – 3000 BCE. Its place of origin is likely to be Central Europe or the Lower Danube area. Our family origin around 6000 years ago is in Central Europe.